Wedding Dress Project: Fourth Time’s the Charm? Here it is! I think she’s done — or, I am at least. Four muslins is a lot, even for something I should really care about. I probably was a little over-ambitious on the scale and scope, but in the end this pattern is quite simple: a seven-gore skirt; two waist-band pieces; and a front and back bodice piece. I like the skirt much more, thanks to Nicole’s suggestion to integrate the godets into the pattern. I was a little unsure, but went back to the old dressmaking books that The Perfect Nose has done everyone the great service of hunting out from the library and rescuing from expired copyright obscurity. These books are also how I made my bodice block: the directions are incredibly clear and I’d highly recommend using a textbook if you’re interested in undertaking that project. I tried the blogs but wound up with all kinds of issues before scrapping the process and using The Fundamentals of Patternmaking. It’s so much better! I actually went back to my back bodice block pattern that I’d originally intended to use. I don’t know why I scared myself out of it, it turned out to be a good solution. 1. Two neck line darts to deal with a little bit of gaping that’s there. 2. Smooth the side skirt. Where the side front and side back meet the panels slope up quite a bit. This is the cause of that weird wrinkle at the top of my hip. 3. Adjust the shoulder on the back to tilt it in towards the spine. I’ve scooped out the v-shaped back (but forgot to photograph like an idiot), I need to account for the fact that there are no darts a the top of the block to pull in the back shoulders. 4. Pull out some of the excess in the back, inside of the straps. Again, you can’t see it because of my aversion to cameras.I think a simple shortening by about 3/4s of an inch on the inside of the back strap will do it. It takes up about three yards worth of material, which is not so bad. My plan is to use crepe de chine or charmeuse as the fashion fabric, underline with some china silk, and then line again with the same fabric as the fashion fabric. How does that plan sound? Thoughts on charmeuse versus crepe de chine? Also, the next step is to make a work dress from this pattern. It will be short and the back won’t be cut out. 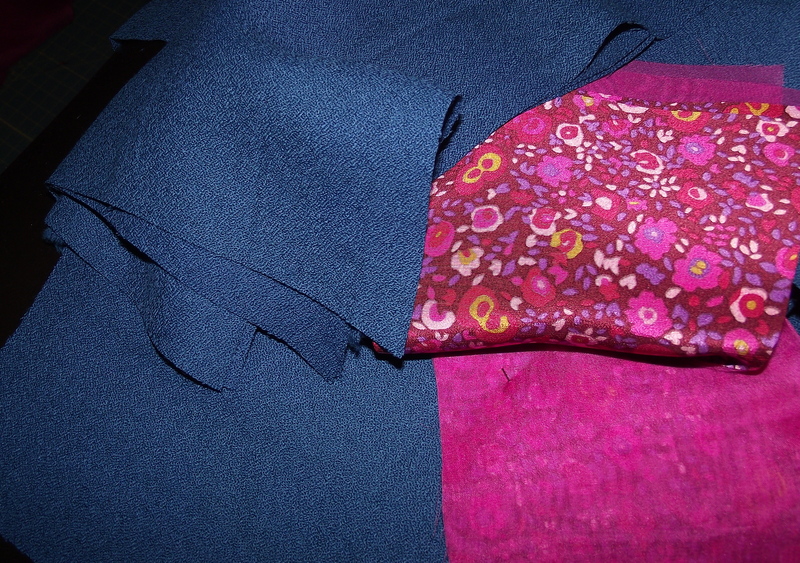 But I figured it would give me a practice round of construction and finishing one more time before starting the dress. I cut out the fabric this weekend, and here’s a preview of the wool crepe, printed silk charmeuse lining and silk organza underlining. Why does that photo look so good when the photos of me look so terrible? Good question. Previous Craft Fail. Or: How I Became the Victim of Baby Shoes. It looks great! I’m impressed. And I love the colors you have the work dress you’re making next. Very cool! And I know next to nothing about photography, but I have found that instead of covering up your window to stand in front of it, stand so it’s lighting you from the side and turn off your flash. Or not 🙂 Like I said, what do I know?